This is a review of The Apostle that I dashed off back in 1998, about half a year after that film was released. I wrote it for a discussion list that is now defunct. I thought, in light of the other recent movie I reviewed (Jesus Camp, it would be interesting to resurrect this from the ol’ mail archives. Since I wrote it eight years ago, it’s a little rough around the edges. But I’m posting it with minimal editorial changes–mainly for the sake of time. Enjoy … and if you get a chance to rent this flick, I think you’ll enjoy it, with the few caveats I mention below. After all the debate about Robert Duvall’s move, The Apostle, I finally got a chance to see it in one of the cheap second-run theaters locally. Tonight, I went back through the months and looked at all the posts in this listserv dealing with this movie, and I’m almost convinced that many of you who paid to sit in theater didn’t pay attention to what you saw! The more I thought about the movie and the comments it elicited here, the more I planned to write. A lengthy treatise began to unfold. But now, as the moment is upon me, I will resist the impulse to blather on. I’ll be quick. I’m no fan of the Southern-style preaching the movie portrays. However, I’ve attended those kinds of churches and sat in those kinds of tent revivals. The movies’ portrayal is authentic. The content, context, style, delivery and tone of the sermons and the services is authentic enough that I felt I had to restrain myself from “going to church” in the middle of the theater! Duvall’s antagonist is a man with deep and severe character flaws. Make no mistake: Sonny is a flawed preacher, and I think Duvall intended to convey this fallenness–it’s just too obvious to be otherwise. Sonny admits to having a “wandering eye” and having “womanized” while travelling the evangelistic circuit. Does that mean Duvall’s character had extramarital affairs and preyed on women in the church? We don’t know. We only know what the film shows us. And what is that? In addition to his admission to his wife, Sonny says to God that he’s made mistakes and that he’s got a weakness for women. 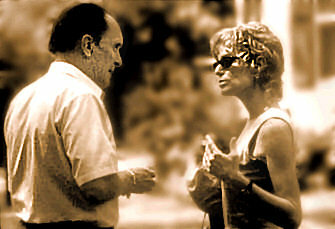 Later Sonny tells a woman that he needs someone to hold during this time in his life, that he’s not like other preachers who have to talk about God all the time — that he can be a man and she can be a woman, “Do you know what I mean?” The obvious implication is that Sonny wants to get in the sack. Furthermore, Sonny dates and kisses this woman while running from his not-yet-divorced wife in Texas. Duvall’s character, Sonny, is shown making several critical mistakes in the wake of his wife’s affair. One mistake was attempting to escape his misery through drink. Another mistake was attempting to end his misery through violence. Another mistake was attempting to end his misery through flight. His final mistake was attempting to end his misery through hard work for God. Each mistake leads to an even deeper error. In the end Sonny finally faces his past, and does not run from it. No matter what you think about the strengths or purity of Sonny’s character for the majority of the show (and it leaves some to be desired) the bottom line is Sonny faces the music. That lesson alone would change a lot of our lives. Mine included. The three conversion scenes in the move are stunning. I can’t describe it any better than that. The simplicity and power of the Gospel is so effectively portrayed that I was moved to tears. Theologically, Sonny’s view of salvation is ‘kin to the Baptists. He’s definitely a once-saved-always-saved preacher, even the name of his church reflects this. One interpretation of this movie might conclude that an impulsive and emotional faith leads to immoral excess–especially if your beliefs insulate you from the consequence of sin. If you truly believe “once saved always saved” then it doesn’t matter what sin you dabble with, because the road to heaven goes “one way.” And perhaps this is Sonny’s deepest and most damning error. Failing to face one’s sin is the inevitable consequence of deluding yourself into believing there are no ultimate consequences to sin. Farrah Fawcett played a merely adequate preacher’s wife. In my opinion hers was the weakest role of the movie, and I don’t know why she was cast for this character–except to make a believably adulterous wife, I suppose. If you watch this movie, don’t mistake the movie for an allegory where Sonny represents all Pentecostal preachers. He doesn’t, and the other men and women of character in the movie are evidence of that. This movie isn’t about “Pentecostal preachers” nor is it about redemption. The movie is about a complex, passionate preacher who is very deeply sincere about his faith–but just as very deeply flawed in his character. The show is about Sonny. If you want to understand The Apostle watch the characters and note who changes throughout the film. Sonny’s character changes, as do the characters of some of those around him, in various ways. It is here where you’ll find the key to this movie. – I don’t know if I’d call it “Southern” preaching as opposed to “Pentecostal” style preaching. I have been to Northern Pentecostal churches and they do their fair share of shouting and praising. Maybe it’s just that I’m sensitive to my adopted land too! I liked how Sonny got things rolling at that radio station. – Not only was Sonny still married, but the woman he was chasing was also married (estranged) at the time, making it a possible double adultery. – When he hit that guy upside the head with the baseball bat he was also drunk. He should have known better and just stayed away from the whole situation. He repeats over and over how much he loved his babies, his jewels, yet does not turn away from things that threatened his babies from being taken away from him (though he may have felt like it was going to happen no matter what he did). The fistfight with the guy (Billy Bob Bad Santa!) outside of church was righteous, as he was led to communicate the Gospel at that guy’s level. – While I agree that he made a mistake by fleeing his responsibility for assault charges, he was not attempting to escape his misery with his “work” afterwards. He could have very easily disappeared and remained a nameless short order cook/mechanic. He went back into his ministry partly because it was in his blood and he may have been looking at salvation (or forgiveness?) by works. When you reviewed “Jesus Camp” and talked about the indoctrination, my mind first flashed to “The Apostle” and the scene where they showed a few of the pastor’s meetings that resembled Nazi meetings. While there was some ugliness in “The Apostle”, there was also some beauty: the anonymous delivery of grocery boxes, his befriending/mentoring of the car mechanic, his working with the retired pastor to start a church. I also liked how he adapted and flourished in his circumstances, and it makes me wonder if I could do the same if I fall on hard times. My main problem with the movie, believe it or not, came with his “self-baptism”. Jesus modeled baptism as a cleansing, a symbolic act of readiness for ministry, and even He had another’s help. There is something very wrong with baptizing yourself, but I just don’t feel like getting into it at this juncture (wouldn’t be prudent!). It’s been awhile since I’ve watched the movie, so maybe I’ll view it in the next week. 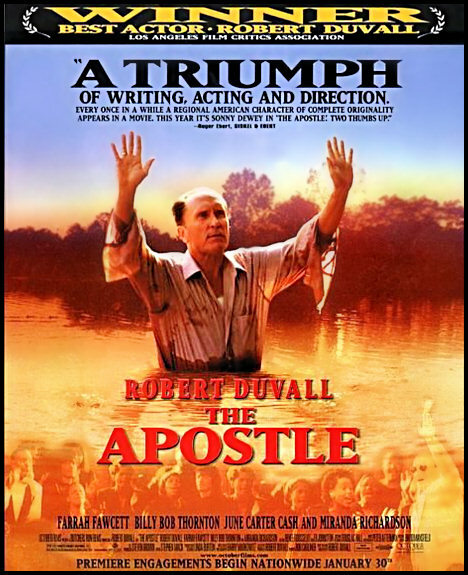 After watching The Apostle I walked out of the theater amazed that Duvall, an admitted outsider, had worked so hard to get our culture right–and he very nearly succeeded. In several points in the movie, I think he did succeed. And as much as I find the “Elmer Gantrification” of Pentecostal preachers distatesful, the same trashy moral examples could be found literally anywhere. Yet when I walked away from Jesus Camp I was amazed that some outsiders who had clearly spent significant time with Penteocostal had simply not gotten it right. And this was the less-fictional of the two films! I loved the preachers shown in The Apostle, I understand they were the “real deal,” Pentecostal preachers who agreed to cameo in the film. And the choir absolutey rocked. I think, when Duvall films the little Pentecostal church having church, they were really having church. I felt the moment was genuine and authentic. Sure, there’s a lot to criticize in the film, and you hit some other great points. But, like you, I think it’s a worthwhile addition to the DVD rack.